Arguably the best known hairdressing company in the world, Toni&Guy have recently opened their fourth UAE franchise location inside the new Dukes Dubai hotel on Palm Jumeirah. The salon – that welcomes both men and women – centres on cut & colour, specialisms of this renowned London brand. With an expert, friendly team who have a wealth of hair styling experience between them, this new location is a welcome addition to the evolving Palm area. Those who have colour in their hair will resonate with me when I say that the harsh UAE sunlight during the hot summer months quite literally plays havoc with our locks. Front dry, split ends to an unnatural, brassy looking tone, the heat is not a friend to our hair. In the mood (and need) for a change, I visited the new Toni & Guy salon to ask for some munch required advice on what to do with my frazzled locks in time for the unofficial new Dubai year. A light, bright and welcoming salon boasting fantastic views out towards the Dubai Marina skyline, this Toni & Guy salon is a change from the moodier, basement locations that we’ve come to frequent in the UAE. This may well be one of the reasons that your time in the salon will pass by in a flash without the need for the previous magazine flick through. Toni & Guy have brought over highly regarded stylists and colours from the UK to ensure that their Dubai customers receive the very best in international standards of hairdressing. Hailing from the UK myself and having frequented the London based Canary Wharf branch more than once before, I was confident in placing my trust in the expert hands of the fabulous staff here. From trendy balayage to more traditional highlights and root tint, colour is most definitely on the menu at Toni & Guy. Starting with a colour consultation with my stylist for the day, we developed an immediate rapport over an extensive colour chart and I was more than happy to take advice on the most suitable shade for my skin tone. With a desire to neutralise the golden tones that filled my hair after a summer spent swimming in chlorine filled pools and salt-water sea, it was a mutual decision to weave some warmer, darker brown through the crown leaving the ends light in their natural whiteness; the overall effect was that of a grown-up balayage, a more sophisticated look for the Autumn. With a new colour also came a revamped cut and my long hair fell down my back in frazzled strands – never a good look. After patiently allowing me to showcase my entire Pinterest board of blonde ‘lobs’, it was settled upon that around 4 inches would be lopped off the ends to give a softer, healthier look. Taking around 30 minutes to apply the friendly atmosphere in this salon seemingly minimised the time for the colour to develop and I was whisked off behind the screen to be washed off. With spectacular sea views and private chrome diving curtains, your own private basin space is the ideal place to grab forty winks as your hair is expertly massaged into a soapy lather. After blowdrying and dry cutting my hair, I was presented with my new look. A fresher, younger looking me smiled back in the mirror and the rich chocolate shade of brown really brought out my green eyes, a stark contrast from the solid blonde colour I’d been sporting before. Toni & Guy Dubai are not just experts in colour but this new centrally located branch is a great place to update your look before a big social event; polished ponytails, beautiful braids and captivating curls are all styles offered that can transform your look in less than 30 minutes. What’s more the legendary label.m products can be bought here meaning that you can continue achieving that ‘just stepped out of a salon’ look and feel at home. To book an appointment, phone +971 (0)4 512 9292. 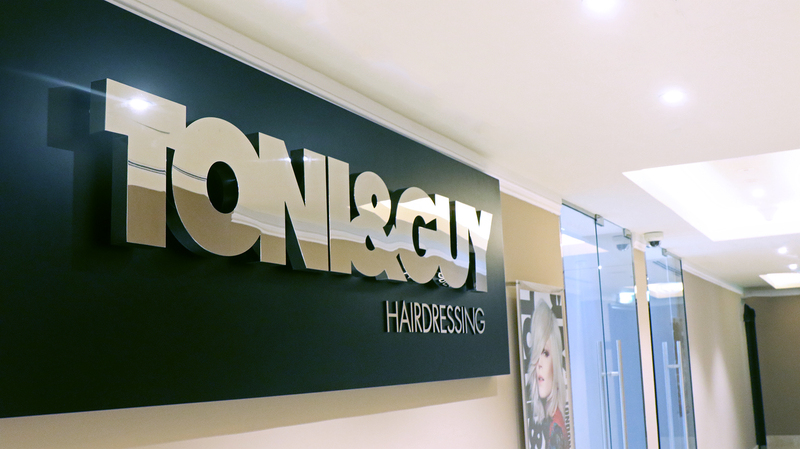 Toni & Guy is located within Dukes Dubai hotel on Palm Jumeirah. Opening hours are Saturday to Thursday 9am-9pm and Fridays 11am-8pm.